Tenocyclidine (TCP, thienyl cyclohexylpiperidine) is a dissociative anesthetic drug with stimulant and hallucinogenic effects. It is similar in effects to phencyclidine but is considerably more potent. Due to its similarity in effects to phencyclidine, tenocyclidine was placed into the Schedule I list of illegal drugs in the 1970s, although it was only briefly abused in the 1970s and 1980s and is now little known. What does TCP stand for in medical terms? 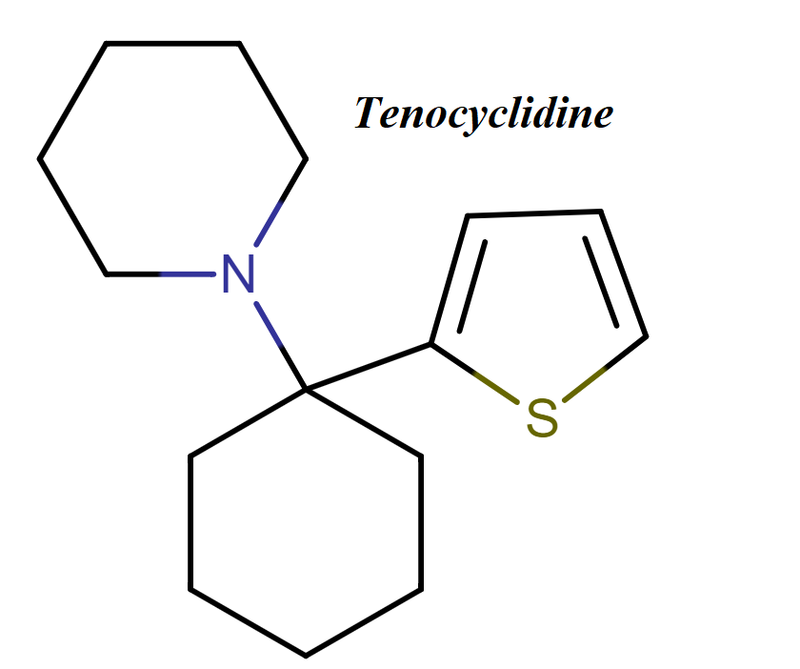 Tenocyclidine is similar to phencyclidine, the difference between two is only a substituent benzene ring. The substitution of a benzene ring in the phencyclidine molecule results in the formation of tenocyclidine molecule. Tenocyclidine is in a class called as arylcycohexylaines, which has a history of being manufactured in illegal laboratories for illicit sale and includes many dissociative drugs. Tenocyclidine binds to NMDA (N-methyl-D-aspartate) receptors and also have an affinity for sigma receptors. But it has more affinity for NMDA (N-methyl-D-aspartate) as compared to sigma receptors. Moreover it is more potent than Phencyclidine in terms of binding to NMDA (N-methyl-D-aspartate) receptors. Tenocyclidine acts as a NMDA (N-methyl-D-aspartate) receptor antagonist means it blocks the activity of the NMDA (N-methyl-D-aspartate) receptor and also inhibits the dopamine reuptake due to which it increases the psycho stimulant effects as compared to phencyclidine. Blockage of NMDA (N-methyl-D-aspartate) receptors in brain also leads to mind-altering effects. Due to similar dissociative effects like phencyclidine, tenocyclidine was listed in Schedule 1 list of illegal drugs. 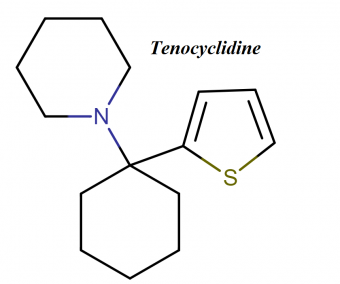 What is the use of tenocyclidine? Because of its high affinity for the phencyclidine binding site on the NMDA (N-methyl-D-aspartate) receptor, the 3H radiolabelled form of tenocyclidine is widely used in research into NMDA (N-methyl-D-aspartate ) sreceptors. What are the long-term effects of tenocyclidine? Long term use of dissociative drugs such as phencyclidine and tenocyclidine has not been investigated properly. As per researches and study, the repeated use of such drugs can lead to development of abuse of the drug as well as withdrawal symptoms associated with it. Some withdrawal symptoms include craving of the drug, headaches, and sweating that occur after sudden stoppage of the drug. Long term effects of tenocyclidine and phencyclidine are persistent speech difficulties, memory loss, depression, suicidal thoughts, anxiety, and social withdrawal that may persist for a year or more after chronic use stops. Tenocyclidine produces similar effects like phencyclidine. Due to alterations in the glutamate at NMDA (N-methyl-D-aspartate) receptors and neurotransmitter dopamine, dissociative drugs (tenocyclidine and phencyclidine) create “high” effects. Glutamate is known to plays the role in learning, memory, emotion, and the perception of pain (the latter via activation of pain-regulating cells outside of the brain). Phencyclidine, a similar molecule to tenocyclidine alters the action of dopamine, a neurotransmitter responsible for euphoria and rush which are associated with many other drugs that people abuse. Person who is taking tenocyclidine in lower doses, feel numb, tremors, disorientation, confused state, loss of coordination, alteration in sensory perception of light, sound, shapes, time, and body image, hallucinations (hearing and visual); feeling separated from self and environment; sense of floating, elevated blood pressure, heart rate, breathing rate, and body temperature. Tenocyclidine is an analog of phencyclidine in which thiophene group is replaced at the place of phenyl ring. The main use of tenocyclidine is in the research and forensic purpose only. 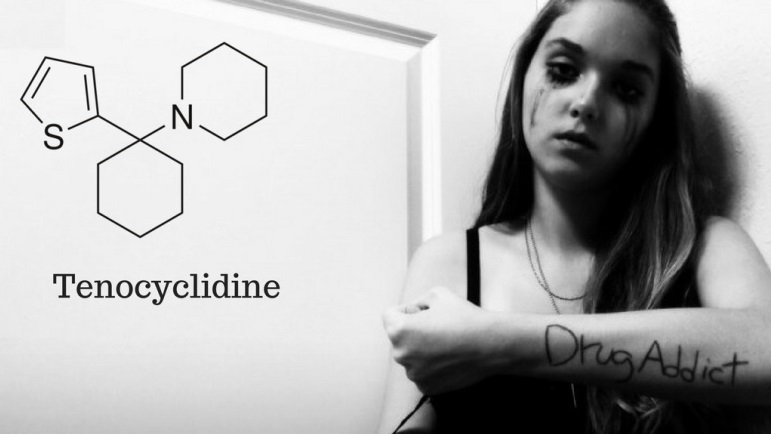 Dissociative effects of phencyclidine are produced when tenocyclidine is abused, which can be more severe than effects occurred by phencyclidine. This drug is rarely used. In higher doses, dissociative drugs shows severe effects initially such as hallucinations (hearing and visual), memory loss, physical changes in blood pressure, heart rate, breathing rate, and body temperature, psychological distress (like anxiety, extreme panic, fear, paranoia, exaggerated strength, aggressiveness), respiratory arrest, and possible death if combined with alcohol or other drugs with central nervous system action. The effects of this drug depend upon the amount of the drug taken and also some effects can be unpredictable. Minutes after the ingestion of this drug, patient can see the effects, which may persists for several hours. Some people even feel the effects of this drug for many days. As per national Institute of Drug Abuse (NIDA) reports, the magnitude of these effects can depend on the amount of the drug taken and can be unpredictable. Effects may begin within minutes of ingestion and persist for several hours, although some users report feeling the drug’s effects for many days. As per reports of NIDA (The National Institute of Drug Abuse), dissociative drugs such as phencyclidine in moderate to high doses, can cause a user to have seizures or severe muscle contractions, become aggressive or violent, or even experience psychotic symptoms similar to schizophrenia. Specific references to tenocyclidine are not mentioned, but they are considered similar to phencyclidine due to same pharmacology. TCP dissociatives properties may result in psychostimulant and hallucinogenic effects often sought after by users of these illicit drugs. In the 1970’s there were reports of TCP found in street samples in Los Angeles, California and in Hawaii; however, by 1975, TCP use were reported in 25 states. In 1980, it was reported that TCP was sold on the streets as a white powder, but it has also been sold as tablets and on plant matter. How long tenocyclidine stays in your system? It depends upon many variables such as what kind of drug test is being used. Tenocyclidine is known to be detected for a shorter time with some tests but can be “visible” for 3 months approximately in other tests. The time for detecting the tenocyclidine in the body also depends upon the body’s metabolism, body mass, age, hydration level, physical activity, and other health conditions which make it very difficult to estimate the exact time of tenocyclidine will show up on a drug test. How long does tenocyclidine stay in the urine? Tenocyclidine can be detected in the urine for 2-5 days. How long can tenocyclidine be detected in blood? A blood test can detect tenocyclidine for up to 24 hours. How long can a saliva test detect tenocyclidine? How long can a hair test detect tenocyclidine? Tenocyclidine can be detected with a hair follicle drug test for up to 90 days, just like many other drugs. The US Drug Enforcement Agency (DEA) placed TCP into Schedule 1 of the Controlled Substances Act in August of 1975. TCP was entered into Schedule 1 as it was considered an agent without legitimate medical use and of high abuse potential. In 1989, another related TCP analog, TCPy, was also been placed into Schedule 1.